Publications: Refereed journal articles and Non-refereed publications (arXiv postings, conference proceedings, abstracts). Click here for the old SIP website. October 2018: Interview about STEM careers for STEM-Away featuring my graduate student Emily Cunningham and myself: Emily's interview highlights, Emily's full interview, my interview highlights, and my full interview. November 2017: Article by Mark Mancini about galaxy morphology in How Stuff Works: "Why Galaxies Come in Different Shapes"
September 2017: Op-ed piece in the Asian Age by Devi Kar: "A bridge to link high school and varsity helps"
January 2017: UCSC press release "Science Internship Program creates opportunities for high school students"
December 2011: Google Tech Talk at Google HQ in Mountain View, CA about "Our Place in the Cosmos"
High latitude tenuous clouds of interstellar dust, commonly referred to as "cirrus", reflect ambient starlight. An optical B band image of one such nebula, 1038+83, obtained with the KPNO Burrell Schmidt telescope. We have dubbed it "The Witch" for obvious reasons. Optical spectroscopy of cirrus clouds with the Lick 3-meter telescope and KAST spectrograph reveals evidence of photoluminescence from hydrocarbons. The centers of dense globular clusters are excellent laboratories for studying the effects of stellar interactions. The central density of M15 is among the highest of Galactic globulars. An HST WFPC2 image of the central 9"x9" of M15, color coded to represent intensities in the U, B and V bands, shows that the stellar density rises all the way in to radii less than 0.5" (0.03 pc). The combination of the KPNO Burrell Schmidt telescope and 2048 x 2048 CCDs makes large area surface photometry possible. 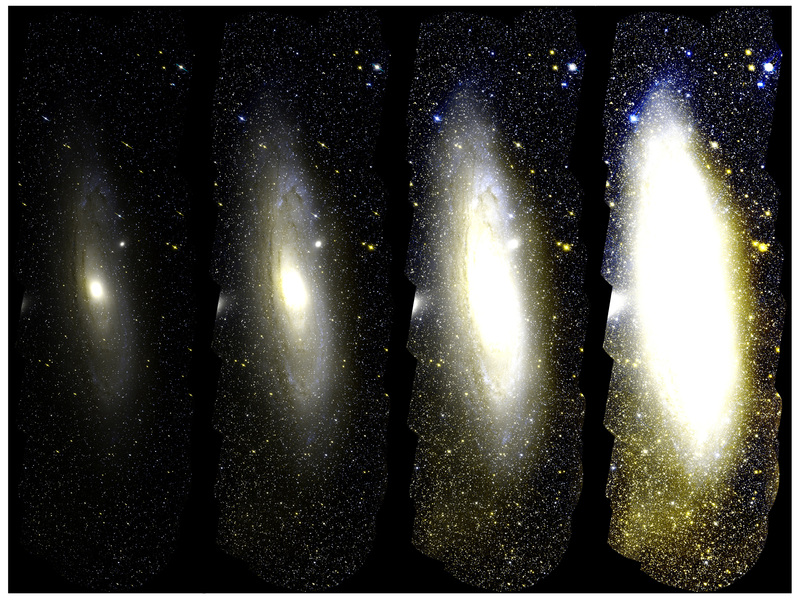 This system has been used to construct an I band mosaic image of the Andromeda galaxy (M31) covering 4 deg x 3 deg. The central 1 square degree of M31, despite being subsampled 3 x 3 pixels in this display, shows striking dust lanes. The satellite galaxy M32 is to the south, while NGC205 (truncated by the mosaic edge) is to the northwest. The full mosaic of M31 is displayed with 22 x 22 pixel block averaging (left) and median filtering (right). The latter is more efficient at removing foreground stars. Note the gradient in the projected density of foreground stars--the Galactic plane is to the north (up)--and the prominent warp in M31's disk. Internal kinematics of faint blue field galaxies can be a valuable probe of their evolutionary history. A z=0.34 field galaxy from our Fabry-Perot study with the CTIO 4-meter telescope shows an O[III] emission line whose width, FWHM = 520 km/s, is significantly broader than the instrumental resolution (left). Further, a spatially resolved kinematical map of this galaxy shows clear evidence for rotation.